StagePresence is a collaborative Virtual Reality project developed by Professor Jeremy Bond of the Game Development faculty from the Michigan State University Media & Information Department and Professor Melanie Bond of the Entertainment Design & Technology faculty from the Eastern Michigan University School of Communication, Media, and Theater Arts. It has been used extensively by Professor Jeromy Hopgood, Technical Director John Charles, and their students in the Entertainment Design & Technology program at Eastern Michigan University. StagePresence was featured in the October 2017 issue of Stage Directions magazine in an article by Jeromy Hopgood and Jeremy Bond (http://stage-directions.com, you can read the article as a PDF here). It is a Unity project that allows you to view set designs created in SketchUp, VectorWorks, and any other 3D modeling software that can output either .fbx (AutoDesk Filmbox) or .dae (Collada) format. 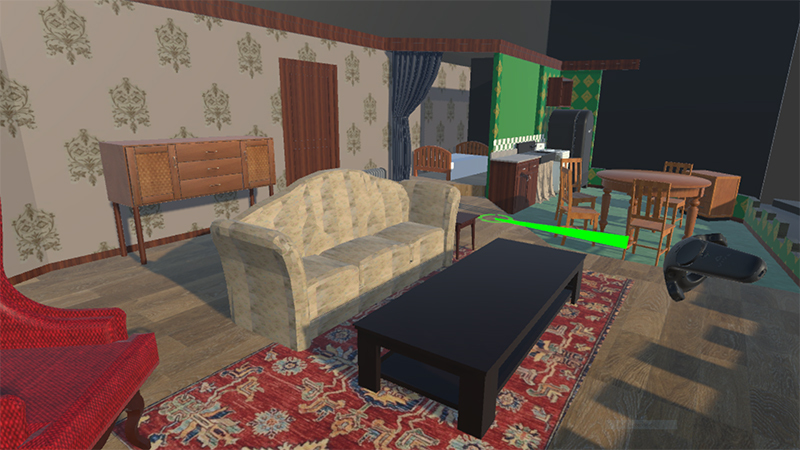 Unity – The free game development software that forms the backbone of StagePresence. More games are made with Unity than with any other game technology, but you don't need to be experienced in Unity to use StagePresence. An HTC Vive – The best consumer virtual reality headset on the market. The Vive is currently the only room scale consumer VR system, allowing viewers to physically walk around their virtual sets. A Powerful Windows Laptop that can handle the graphics requirements of VR software. We recommend at least a NVIDIA GTX 1070 graphics card. We strongly recommend a high-end laptop over a desktop PC because it will allow you tremendous portability. The entire EMU StagePresence setup, including the laptop, fits easily within two medium-sized backpacks. Check out the StagePresence instructions. These instructions include all the information you should need to get started. If you have any questions, feel free to contact us using the menu at the top of the page.